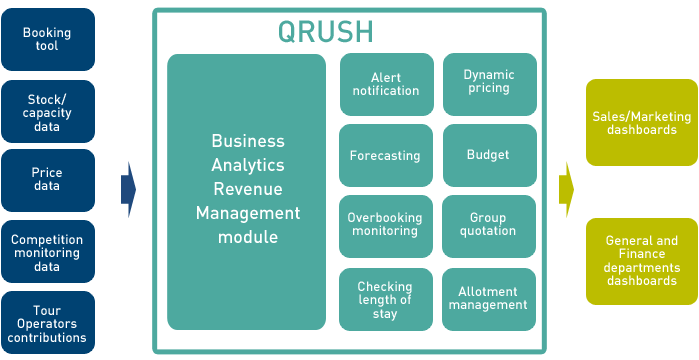 The QRUSH web platform, developed by EURODECISION in close collaboration with its client TOHAPI*, provides Pricing and Revenue Management teams in the tourism and hotel industry with the keys to taking the best decisions and managing their prices and capacity. QRUSH now manages approximately 80 000 accommodation units (campsite pitches, mobile homes, chalets, self-catering accommodation, residences) and covers several million bookings in Europe. QRUSH was built on the business knowledge that our consultants have acquired over the course of their Pricing and Revenue Management assignments. It is the embodiment of our desire to synthesize this hands-on experience by instilling it with EURODECISION’s particular quantitative vision. With its forecasting and optimization algorithms, QRUSH enables users to forestall demand, to build dynamic pricing strategies to late or early bookings and to balance customer demands on the basis of their real contribution to overall income. We created QRUSH to support small and medium accommodation providers in their Revenue Management skills development process. It centers on data and the men and women who interpret them. QRUSH is designed to provide “views” that will guide analysts’ decisions rather than “black box” decision dispensers. QRUSH provides key Revenue Management indicators graphically and multi-dimensionally, while incorporating advanced mathematical tools to guide decision-taking. QRUSH is an operational tool for daily use by Revenue Management analysts, but above all it is a Business Analytics platform that matches up booking data with stock data and financial data. Traditional hotel sector revenue management KPIs (RevPAR, Occupancy Rate, Average Price, etc.) and sales trends (Pick-up, Buildup) are valuable for everyday use, but QRUSH can also be used for auditing Revenue Management activity and recommending quick-wins to marketing teams. *TOHAPI : consumer brand of the Vacalians Group (formed by the merger of the Village Center and Vacances Directes groups). TOHAPI is a leading European outdoor accommodation provider that distributes mobile homes, chalets and camping pitches, with 20 000 accommodation units all told over more than 300 camp sites in France, Italy and Spain.